In early November, Creative Carbon Scotland hosted a discussion as part of the Scottish Government's consultation on the development of a new Culture Strategy for Scotland. Joined by arts and sustainability practitioners working across a range of contexts, we focused on the connections between culture and climate change and the role of the arts in wider society, particularly in relation to environmental sustainability. We convened the meeting around three key questions, relating the Scottish Government’s Culture Conversations questions to the issue of climate change. We also provided an online survey for those who were unable to participate in the event, some of the points from which are also included here. What do you perceive as the role of arts and culture in contributing to a more sustainable Scotland at individual, organisational and strategic levels? The arts can act as an agent of change and has a role to play in place making, community resilience and environmental education. There is a need for work to take place across strategic, organisational and individual ‘levels’ – our strategic organisations need to be bold whilst the action and leadership of organisations and individuals enables and creates the spaces for these overarching organisations to make significant sectoral change. There is a challenge in articulating what a sustainable Scotland looks like and therefore a need for the arts to help society imagine what needs to change and how – both now and in the future. Sustainability criteria could help identify inherently unsustainable arts practices and activities, and be considered as factors when making funding decisions. Scotland’s cultural sector has the opportunity to be a leader in embracing the international challenge of sustainability. The growing network of 600+ sustainability and arts practitioners engaged in building connections between culture and climate change, supported through Creative Carbon Scotland’s Green Tease events programme. Addressing sustainability and climate change requires collaboration. It’s very difficult to adapt to climate change on your own, much like changing transport issues: it requires more parties and more structural change to take place. 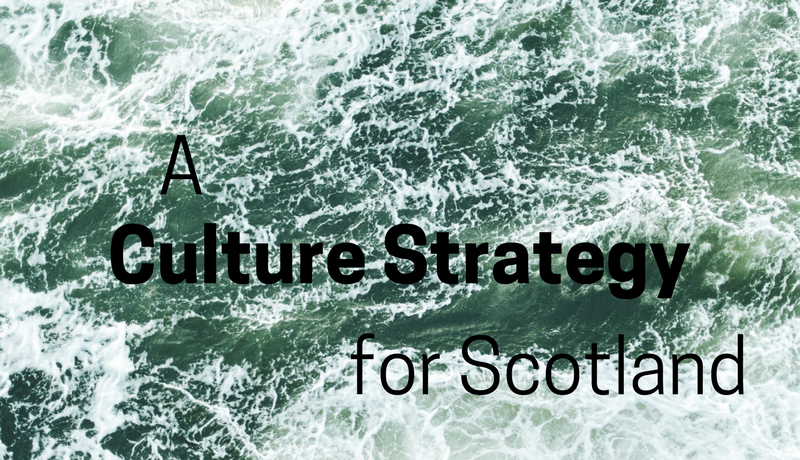 The Culture Strategy should incentivise collaboration within Scotland (i.e. much like how match funding works; how academic projects require community partners; how EU projects require certain partners). This would help to reduce silos of people working with the same partners all the time. There are examples of successful projects which encourage people to engage with the natural environment and sustainability (e.g. using woodland as theatre, props sourced from woodlands, embedded within community, connecting arts practices and community renewable energy developments.) However, these struggled with funding as they didn’t fit into traditional sources of arts funding (e.g. Creative Scotland Open Fund, Trusts and Foundations, corporate sponsorship) which isn’t really focused on community projects or community/forestry funding which isn’t really focused on arts projects. The Culture Strategy could usefully support this sort of cross-departmental and cross-silo working. The strategy could encourage the embedding of individuals for cross-pollination. For example, placing sustainability professionals in all Non-Departmental Public Bodies working in some aspects of culture (e.g. HES; Creative Scotland) and placing people used to working on longer timescales for climatic change (e.g. forestry professionals), to help shape strategic cultural planning. Other examples discussed included the work of The Stove Network as an arts-led approach to the regeneration of Dumfries town centre (see contribution to the Culture Strategy online forum); The Embedded Artist Project model developed by American civic artist Frances Whitehead; and the work of Watershed+ in Calgary, Canada which includes artistic practices as part of any major infrastructural projects which take place in the city. What are the priority areas to further the role of culture in bringing about transformational change to a more sustainable Scotland? We discussed that a priority area would be the incentivisation of true collaboration – a ‘duty to collaborate’. We acknowledged that this would be challenging but that it could be incentivised and implemented within a reasonably quick timescale. For example, embedding 30 artists in public bodies in 3 years, and vice versa. This could also work across all three ‘levels’ as previously discussed (e.g. Creative Scotland and Department for Energy and Climate Change; Scottish Chamber Orchestra and RSPB Scotland) and could also apply to other areas including health and education, therefore encouraging more ‘cross-sectionality’ generally. The ability to collaborate is something which some artists are adept at, and the difficulties in this is often where good art thrives. Artists are also often not as bound to particular institutions as other collaborators, therefore able to bring their own interests to the table. A way in which to ‘operationalise’ collaboration could be to require all Non-Departmental Public Bodies to make climate change one of their core aims and required to deliver cross-sectoral projects. There’s an opportunity to better support environmental reportage in Scotland including large scale projects such as film, theatre and documentary literature. As well as being published here these notes will be fed back to the Scottish Government via the Culture Conversations resource pack and will continue to inform and shape the work of Creative Carbon Scotland in supporting the role of the arts in contributing to a more sustainable Scotland. Subscribe to the Creative Carbon Scotland Newsletter to receive monthly information about news, events and opportunities in Scotland and further afield.